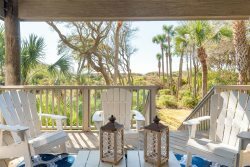 We are a boutique vacation rental company on Kiawah Island, Seabrook Island, Wild Dunes, and Isle of Palms specializing in a luxury experience for our guests and homeowners. We've built a team who is like family, rather than a company of hired employees and this shows through all facets of services we offer. Our team prides itself in going above and beyond to ensure that both owners and guests enjoy the entire process! Sweetgrass Properties has offices throughout the Charleston area. Our offices are located outside of the gates of Seabrook Island and on Isle of Palms. Sweetgrass Properties has a complete reservations staff that is well versed in all aspects of each of our rentals homes, and the surrounding islands. We take great pride in what we do on a daily basis. We strive to provide high-end customer service and a luxurious experience every single time.